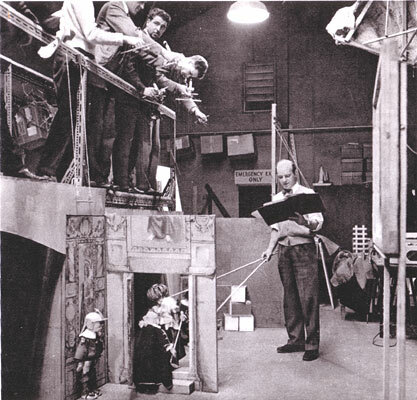 The BBC Television Puppet Theatre was housed initially in a 'tin shed' between the main studios and the canteen at the BBC's Lime Grove Studios, Shepherd's Bush; later moving to a purpose-built studio at BBC Television Centre. In the picture above, camera angles are being worked out for a production of "The Emperor's New Clothes." 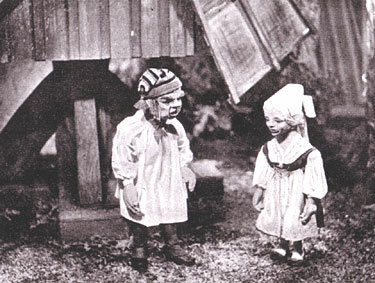 A Scene from "The Petrified Princess"
Under the stewardship of Gordon Murray, over 50 plays were written or adapted for marionettes and transmitted live between 1955 and 1964; the most popular of these productions being "Rubovian Legends." Other members of the Puppet Theatre Company included Andrew & Margaret Brownfoot, Bob Bura & John Hardwick and Molly Gibson & Audrey Atterbury. 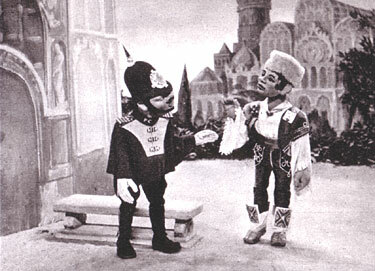 A Scene from "The Winkleburg Armourer"
Soon after moving to Television Centre in 1961, the BBC merged its Children's Programmes and Women's Programmes. This signalled the start of a gradual scaling down of puppet productions, which finally ended in 1964 with the Puppet Company being disbanded and the purpose-built Puppet Theatre Studio falling into disuse. It would be another two years before Gordon Murray produced his next puppet production - Camberwick Green - but now using stop-motion animation instead of marionettes.